The answer is, now I do, and I think you might like it too. But I have to warn you now before you start, some people do not like the gummy texture of the pearls. If you are reading this though, you probably aren't one of those people. 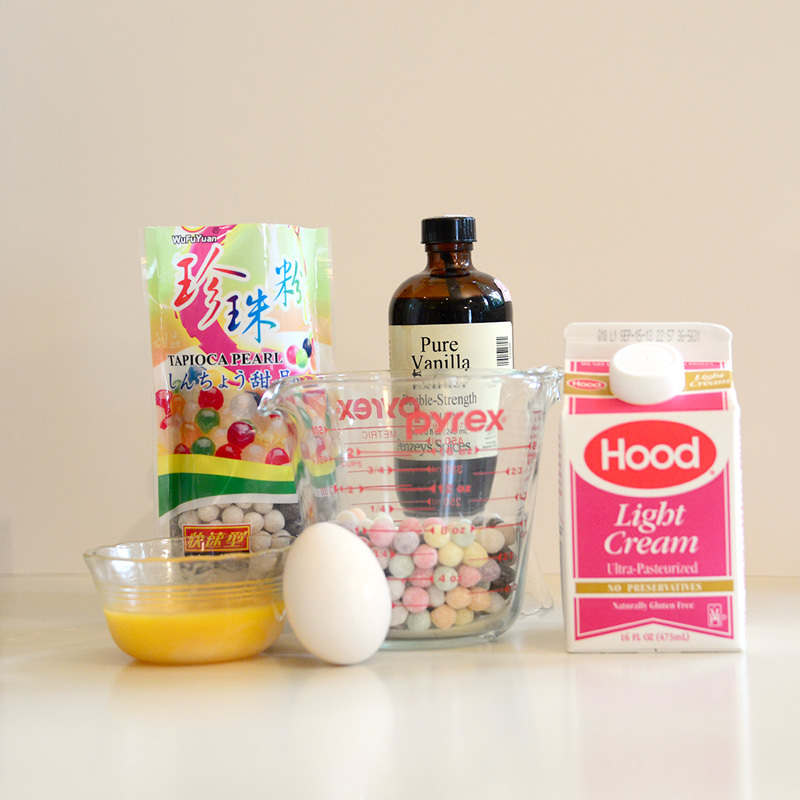 5 egg yolks (substitute 1 whole egg for lower cholesterol) we saved the whites to make fortune cookies. 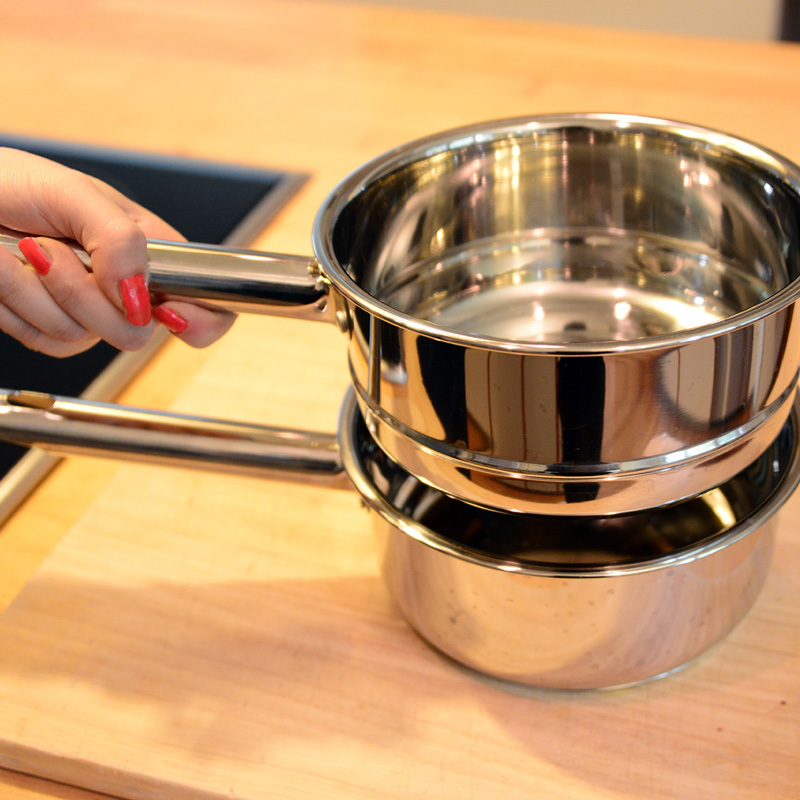 A double boiler - If you read that part and said "whats that" or "oh no," don't get intimidated. 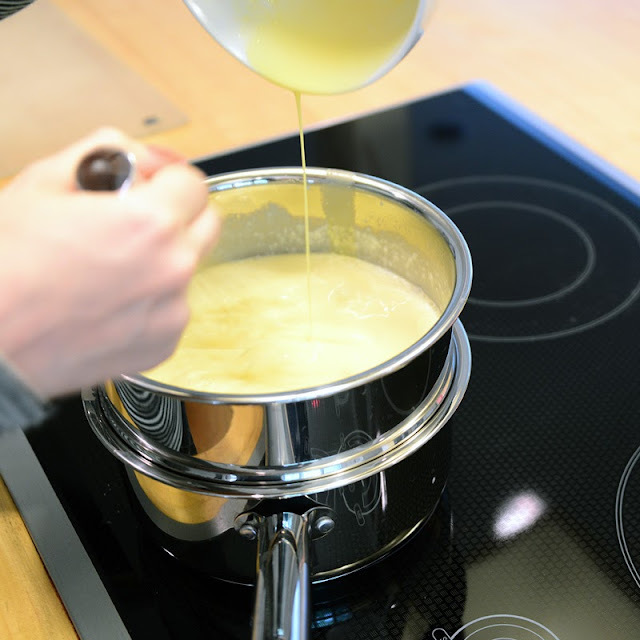 A double boiler is a piece of cookware that helps keep the temperature from getting too high while you cook. Water goes in the bottom pot and you cook in the top.They are great for confections and sauces that have sensitive cooking temps and actually make things less complex. If you don't want to buy one you can make one like this person did. 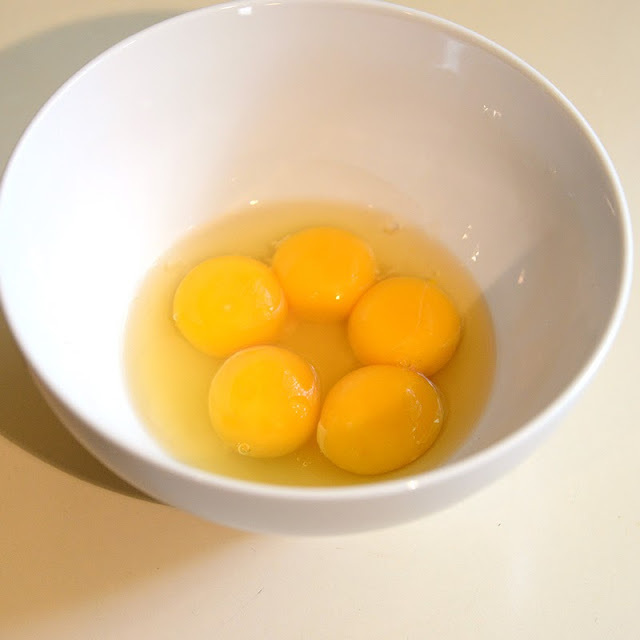 Start by prepping your eggs, beat them until blended and slightly frothy. Set them to the side of your cooking area, you'll need to be able to reach them later. 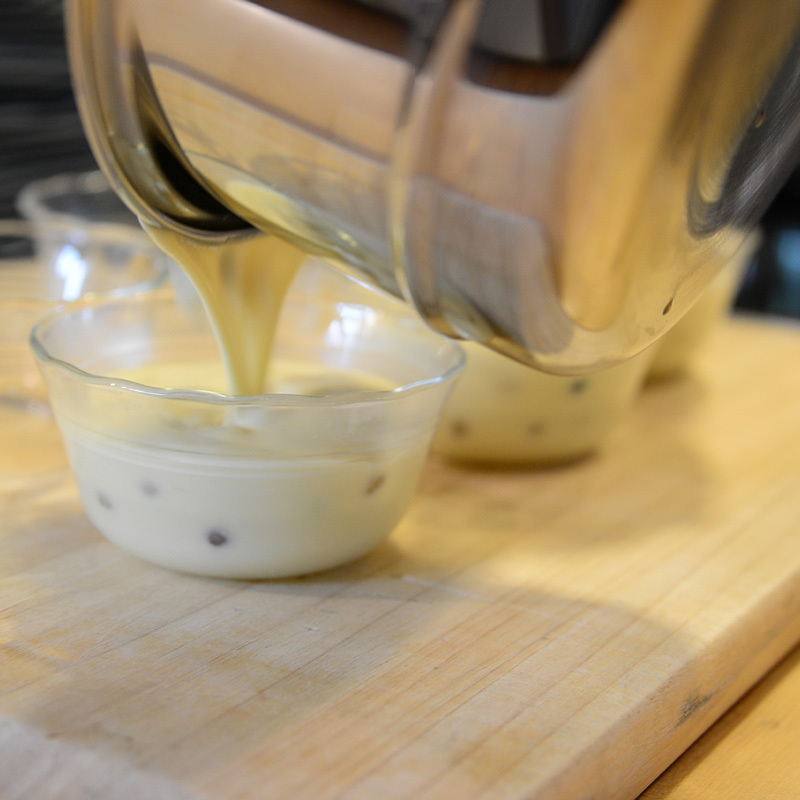 Add some water to the bottom of the double boiler and set that aside for later too. 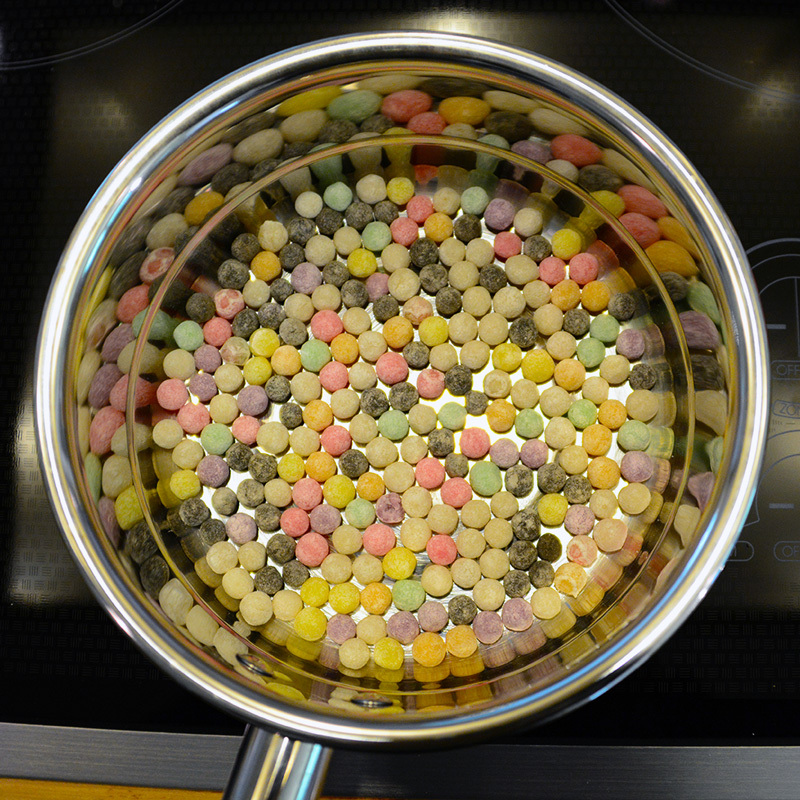 Put the balls in the top pot of the double boiler and add the cream and sugar. You are working with the pot directly on the stove at this point. 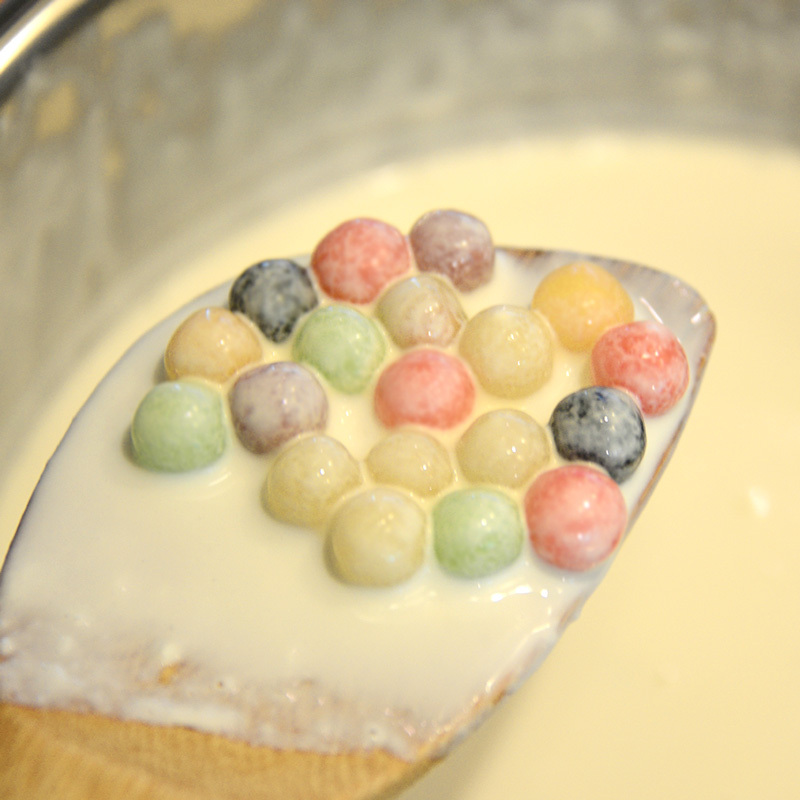 On medium heat, cook the tapioca until gummy, you may or may not have had them before, but they get gummy and plump when ready. When the tapioca looks cooked,strain out about 20 pearls and set them aside in a bowl. Now you are going to temper the eggs. 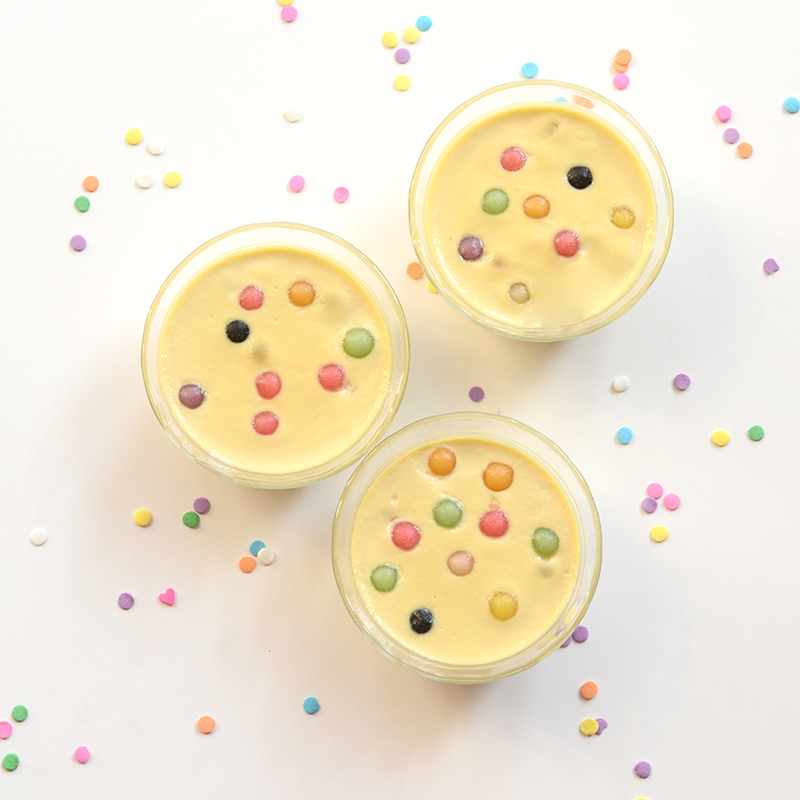 In a custard, if you heat the eggs to fast they will get clumpy and be a bit like scrambled eggs in your pudding, but this is very easy to avoid. Solution: While whisking the eggs, add slowly about 1/3 of your cream ans sugar mix to the eggs. 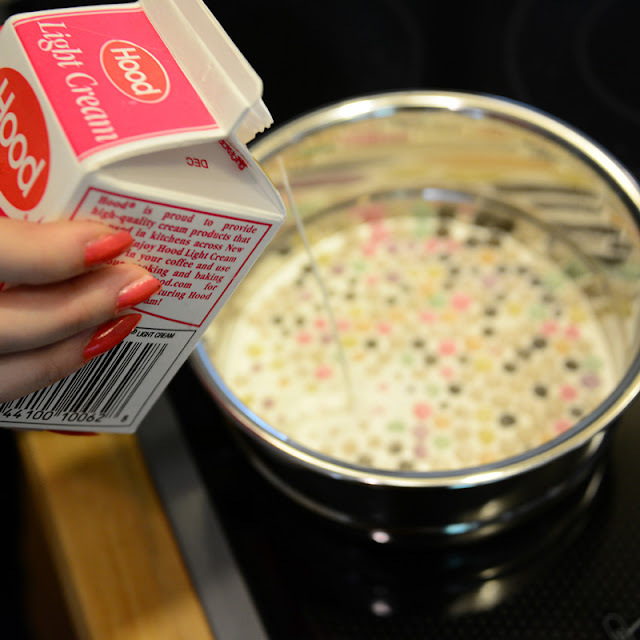 Now put the rest of the cream and sugar mixture on a cool burner, place the bottom pot of your double boiler on the hot burner. 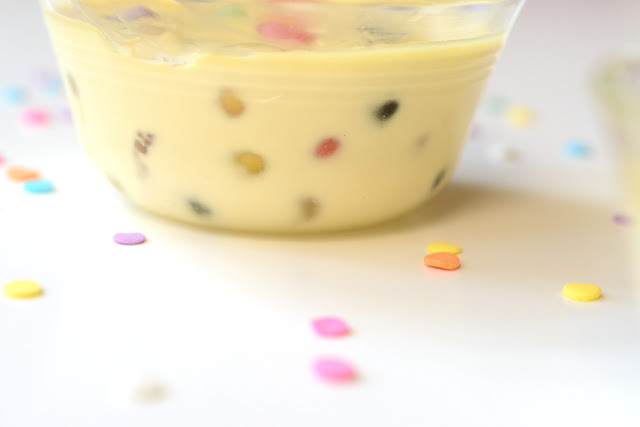 Place the hot mixture on top of the double boiler, it is now impossible your upper pot to get too hot and burn the pudding. 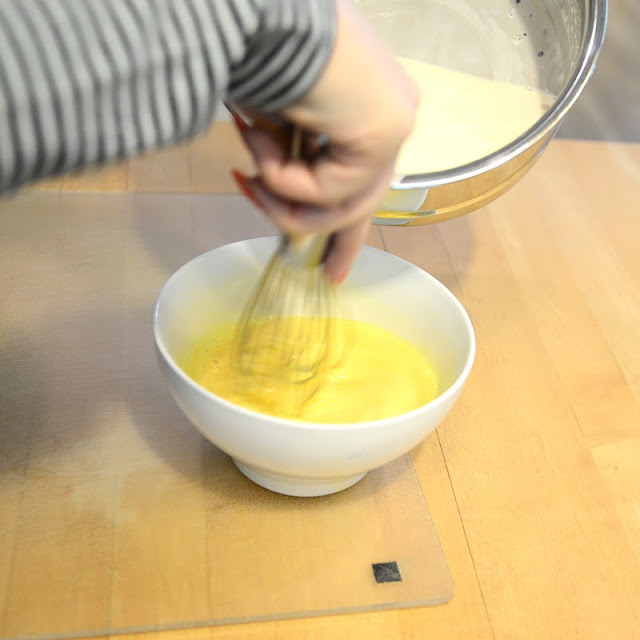 While whisking, take the warm, tempered egg mixture and, and slowly add the eggs to the cream. The hard part is over now, not too bad, right? The pudding will start to thicken after about 10 minutes, when it is starting to look and feel like pudding as you mix it, it's ready. Pour into cups or your serving bowl. 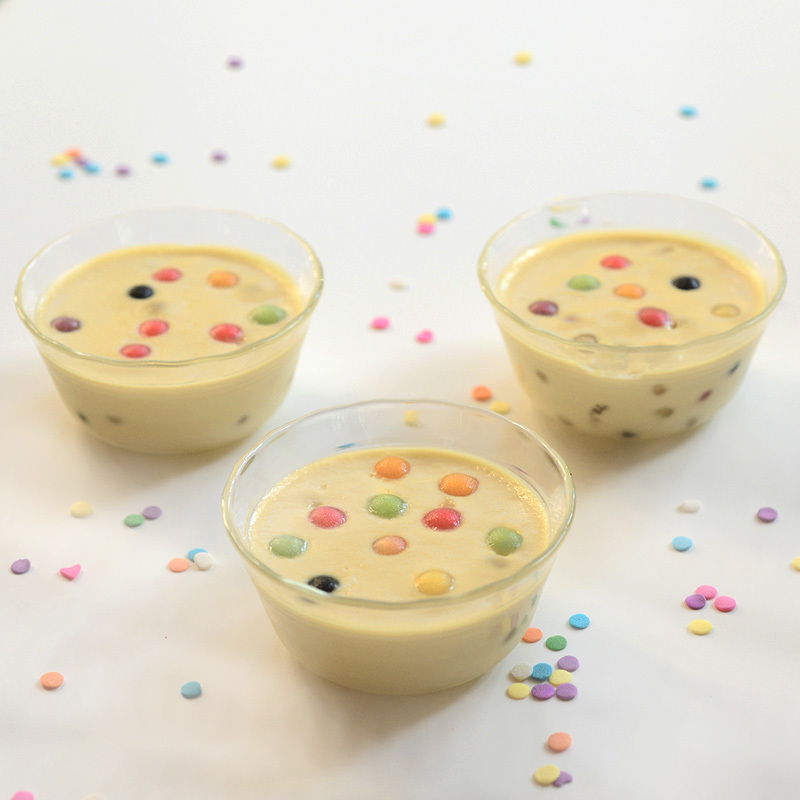 Now take those leftover pearls and plop them on top to really show off how special your tapioca is. You will be able to see the colors from the sides a bit too and as you eat. So dig in, warm or cooled. Wrap the top if you refrigerate and do not keep too long, boba tend to harden over time unless reheated (Read: best eaten same day or warm). Also can you find the heart in that last pic?